Tombstone Monument Ranch is definitely one of a kind. The accommodation is purpose built as the main street of a Wild West town just two miles out of Tombstone itself. Opened in 2010 it now belongs to a consortium including the True family who own the White stallion ranch in Tucson, and they are expanding the facilities so they can welcome even more would- be cowboys from around the world. This is no one horse town..
New corrals are under construction now and will welcome new horse related activity including team penning and even rodeos, and a brand new entrance to the ranch will maximise on the stunning mountain views. The hotel side of things is pretty up market with beautifully furnished modern rooms with a Wild West twist. I stayed in the Post Office but you could stay in the Courthouse, the Mining Office, the jail or even Kitty’s Bordello! There’s a pool and a Jacuzzi too to soak your saddle sores away should you so wish. You can even try your hand at archery and see if you can head the Apaches off at the pass, or like me, maybe just try to burst a few balloons tied to a sack full of hay. Out of the saddle, there’s always the attraction of Tombstone where the world famous gunfight at the OK corral is re-enacted three times a day. Needless to say the good guys always win. Another excursion you can do, organised from the ranch, is to the nearby Dragoon mountains which majestically dominate the horizon. You can do this with Charlie One horse a member of the local Yacqui Indian tribe. Just don’t get him confused with no horse Charlie who is a completely different person and they don’t get on at all. Charlie One Horse, will tell you all about the history of the native people who lived and died here. This was real Apache country and you can still see the ancient petroglyphs when out riding– pictures of animals and people and suns – scratched onto the rocks around the ranch. You half expect to see Cochise coming over the hill on a painted pony.. There are plenty of lovely horses to choose from for your slow rides and your fast ones. I rode the tall, dark and very handsome Stretch, who was big and gentle and gave me a great view of the greenest desert you may ever encounter. 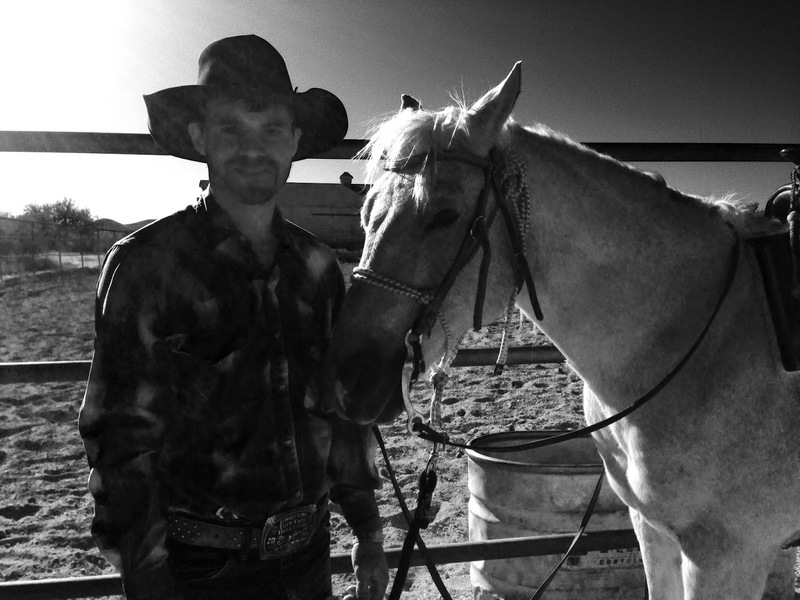 Our wrangler Cody, was a real live cowboy. Brought up with horses, he also liked to ride 200 lb plus bulls for fun in the rodeo, and was nursing a few separated ribs as a consequence of contact with a flying hoof earlier that week. Make sure you have a spare handy.. The landscape here is stunning with the green ‘three brothers’ hills close to the ranch looking like the backdrop to many a famous Western movie. There aren’t any big Saguaro cacti here but there are other smaller types, and cat tails and delicate desert flowers are in bloom. There are huge black and white and colourful green and yellow and red grasshoppers exploding into the sunshine everywhere. They are called Mexican Generals, because of their bright colouring which mimics the fancy garb of a high ranking officer in dress uniform. 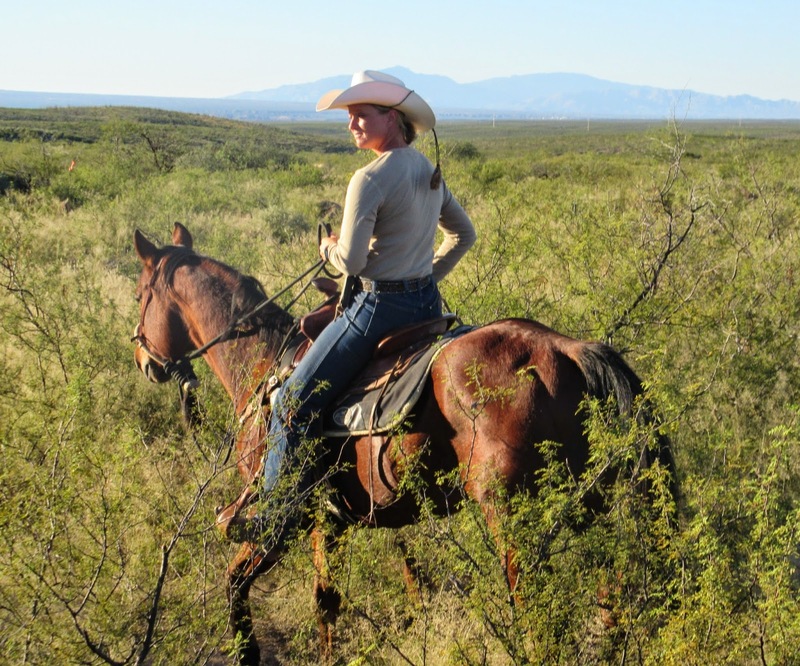 You can walk your horse through the green rocky mountain trails and then lope along the sandy ‘wash’ or river beds which become full when the rains come in the summer. We wound our away past the Schieffelin Monument where Ed Schieffelin is supposed to be buried standing up, watching over the land that made him rich when he discovered silver deposits here, which led to the founding of Tombstone. Then we swung past the ‘no shooting sign’ which was riddled with bullet holes, and spotted some recent Coyote tracks in the dust. Meals are in the dining room next door to the saloon but three times a week there’s a breakfast cook out with a real pot of strong black cowboy coffee, bubbling over the fire. In the evening you can make your way to the Trappman saloon across the street for a shot of hard liquor, a beer, or some of the special blend on tap Margaritas. The saloon is quite something and pretty realistic – a bit of a labour of love when it was built. and has been fitted out with bespoke wooden furniture handcrafted in Germany. While you are there maybe try a game of Faro, a French gambling card game played between a banker and several players. The game was popular in Tombstone during its 19th Century heyday and the good news is that nobody loses any real money! Here comes the high roller! 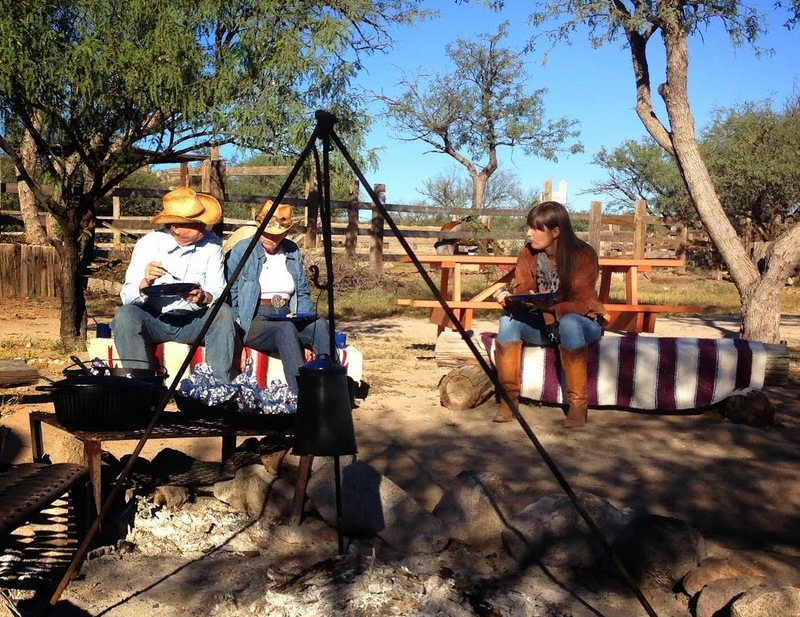 The Tombstone Monument Ranch gives you the opportunity to live out your Wild West dreams as far away from the rat race as you could possibly get. Set in genuine cowboy countryside, the ranch welcomes couples, families, singles and corporate guests alike – a Harley Davidson convention recently brought fifty bikers into town! This ranch is as unique as a gold nugget and you need to saddle up your travel plans and get there before the Gold rush starts!